I have to admit... this week has been a bit frustrating as far as the scale is concerned. 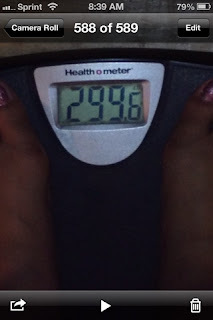 I was over-the-moon happy on Christmas when the scale said 299.6! I got my wish! But the next day... inexplicably... The scale shot up about 2 lbs. I wondered if it was all the exercise I did on Christmas day, because I KNEW my food was good... no cheating! Then a few minutes later I realized my cycle had started.... OK! Well, since last Wednesday, the scale has been anywhere from 300.0 - 300.8... But I haven't freaked out. I have a REALLY long menstrual cycle that can last up to 10 days. AND I've been to the gym or exercised at least 4-5 days this week. My body may be freaking out a bit. I keep telling myself it's ok... I am doing what I need to be doing. My carbs are low. My calories are low. My protein is high. I'm exercising. Drinking lots of water. Eating good, unprocessed food. It will all be okay... The number on the scale is just that... a number. But... when I got on the scale this morning... I saw this. Happy new year to me! It's not by much, but it really makes me happy for my starting weight of 2013 to be UNDER 300 lbs... I really hope it's not another tease and that my body is ready to lose some more weight. God knows I'm putting in the effort. Today makes FOUR WEEKS SUGAR FREE! This is defnitely the longest I have ever abstained from sugar/white flour. And even though I still have cravings... they are NOT overwhelming. I feel so much stronger and in control of my eating now. It's an amazing feeling. Don't forget to comment on THIS POST for my 2nd book giveaway! And check out my friend (and fellow blogger) Shawn's new book on Amazon! I will give a better review when I finish reading it... but so far it's awesome! 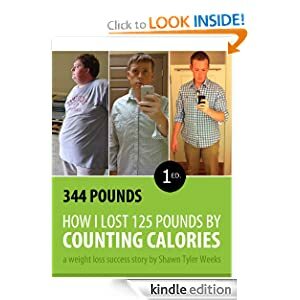 You can find Shawn at http://www.344pounds.com. Good way to start the new year. I've heard it takes 5 + days for exercise/eating to reflect on your weight. Way to go!! That's such a good feeling passing big milestones! You're rocking it! Way to keep strong thru the holidays! And 4 weeks without sugar? I need to borrow some of your will power!! That's awesome!! Keep it up!! I remember breaking the 300 threshold. I'm trying to do it again. Woo hoo! good job lady! Keep it up! it is just a number, but when that number starts going in the direction you want it to you can't help but get excited! what an awesome Christmas gift. 4 weeks without sugar? You are a total rock star and an inspiration. Happy New Year! Even if it does go up and come back down. I have found that many times I will go up and down and up and down in a 4-5 lbs range, and then one day I realize it is going up and down again, but in a different 4-5 lbs range, a lower one! Well at least when I am focused I see that ;)BUt either way that is awesome! Nothing like getting below a major goal you have had. You can do it!. Wow! You are really trucking right along! I am so impressed with your willpower over the holidays! Oh I SO can't wait until I get to be under 300 again! Congrats! Congrats, I know that is a good feeling! Pick a day and stick to it.